Now, I’ve been cooking Jewish food for several years, but because of my husband’s ancestry and birthplace I’ve focused more on the Sephardic side of the cuisine. Certain Ashkenazi dishes are foreign to me. While this dish is made by both Sephardic and Ashkenazi Jews, it’s more of an Ashkenazi favorite. The only thing I knew about matzo brei was that it contained eggs and matzo. 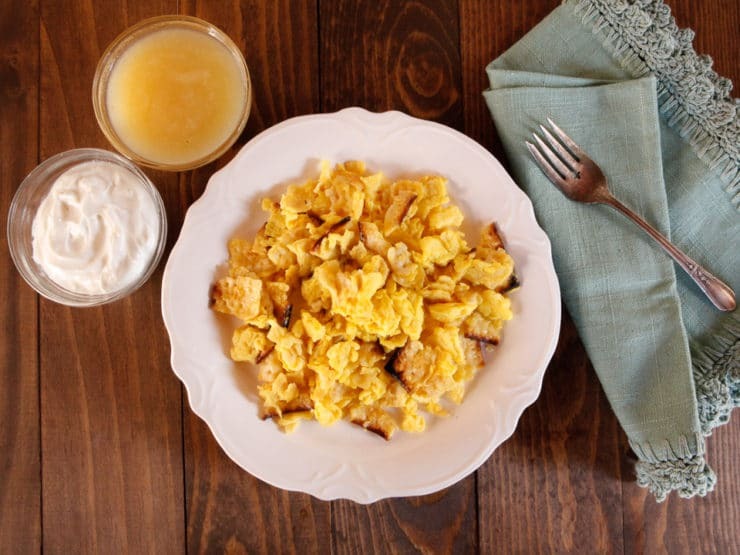 I like both eggs and matzo—the idea of the two being scrambled together was intriguing. Not knowing any better, I’d always thought the dish was pronounced matzo bree. My hubby corrected me. How my husband knew that, I don’t know. So brei rhymes with try, huh? Feeling adventurous, I decided to try it and see what I was missing. The waitress came to take our order. “I’ll have the matzo brei,” I said proudly, my pronunciation pitch-perfect. “Would you like it salty or sweet?” she asked. Sour cream and applesauce? With eggs? Maybe this breakfast experiment wasn’t such a great idea. But I wasn’t about to chicken out. I was in it to win it. After about ten minutes, the waitress brought me a plate of matzo brei. It looked harmless enough, and it smelled good. I decided to dig in. With my first bite, I tried the eggs and matzo on their own. Yum, I thought. Second bite, I tasted the eggs and matzo with a dab of sour cream on top. Double yum. Finally, I tried a bite with everything… eggs, matzo, sour cream, and applesauce. Have mercy. I’m in matzo brei heaven. Now I understand why some people like this dish sweet. After that first taste, I ended up piling on the applesauce. There’s something about that added sweetness that really enhances the egg/matzo mixture. I cleaned my plate. It’s the perfect comfort food, and it stuck with me all day… I skipped lunch. Fast forward to now. Matzo brei has become a regular part of our Passover meal rotation. It’s a great way to use up the extra matzo from the Seder. We eat it for breakfast, brunch and brinner. It’s so adaptable and tasty, we actually look forward to it all year! How do you like your matzo brei? 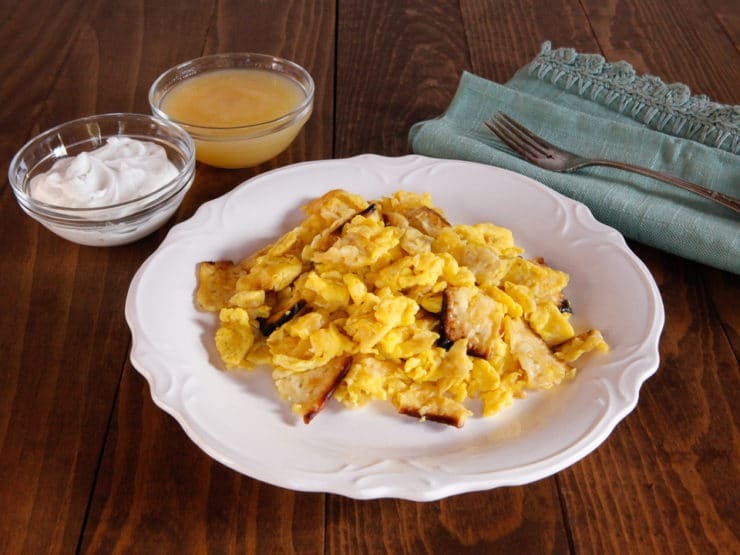 Learn to make Matzo Brei, an Ashkenazi Passover breakfast dish with matzo, eggs, applesauce and sour cream. Kosher, Dairy, Deli Favorites. Applesauce, sour cream, sugar, cinnamon, apples, nuts… you can even get creative and add grated cheese or diced veggies. Scramble 2 eggs in a bowl with a whisk along with 1 tbsp milk or water until the eggs are nice and fluffy. Run a sheet of matzo under running water for 20-60 seconds until it just begins to soften. The amount of time you'll need to keep it under the water depends on the type of matzo you're using. Let it get soft, but don’t let it turn mushy! Shake off the excess water and reserve the matzo. 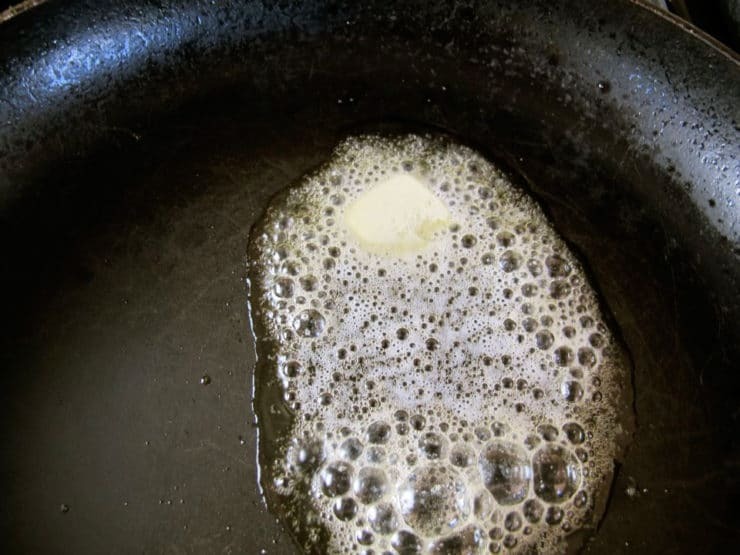 Melt a tablespoon of butter in a skillet over medium heat. 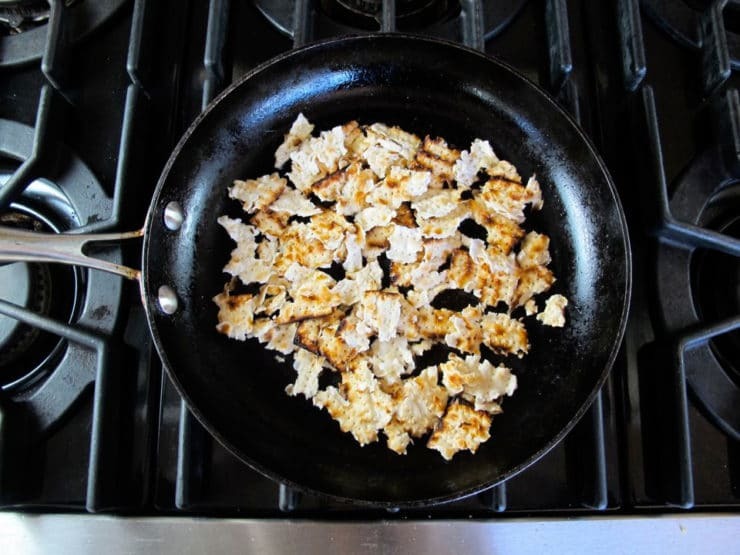 Break matzo into bite-sized pieces and place them in the skillet. Sauté the matzo pieces over medium heat for about a minute, until they are evenly coated with butter. 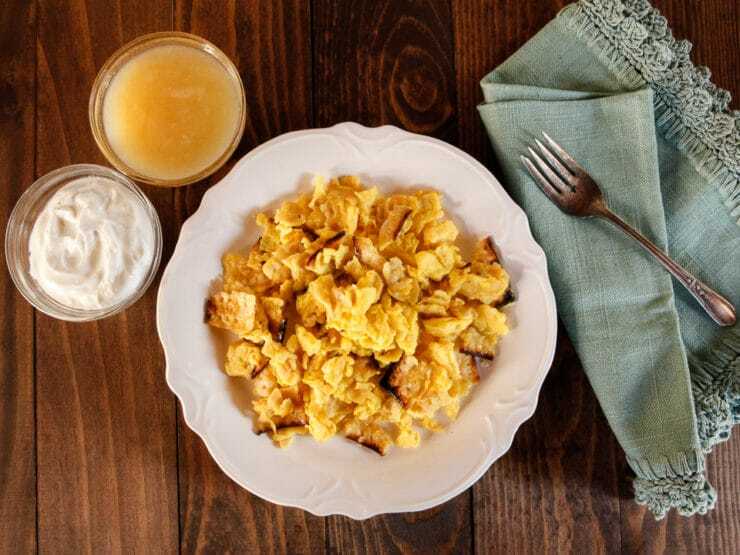 Pour the scrambled eggs over the matzo pieces. Stir the eggs with a spatula until they are well combined with the matzo. Cook the eggs for about 2 minutes over medium, flipping and stirring continuously—don’t let the eggs sit, or they will overcook. You want the eggs to be cooked soft- not runny, but just barely cooked. Overcooked or browned eggs ruin the flavor entirely. As you are cooking, sprinkle in salt and pepper to taste. This would also be the time to add sugar, if you want a sweeter matzo brei. 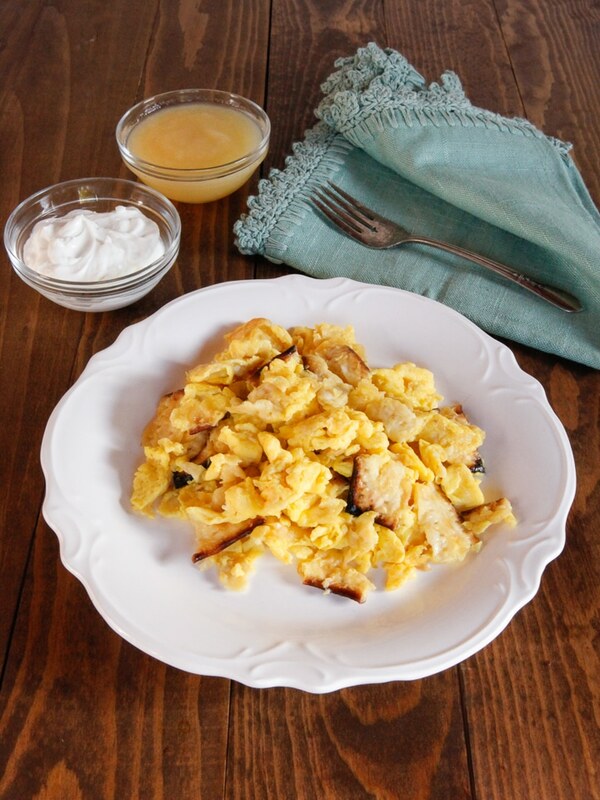 Serve the matzo brei immediately with a small side of applesauce and sour cream. Note: If you are planning on adding extras like diced vegetables, nuts, or fruit, sauté them with the matzo and butter. Add extra seasonings or cheese with the eggs. What’s this brei stuff? I have been eating FRIED matzo for 50 years and about ten years ago I start hearing matzo brei. About the same time the Nyfat started getting hard to find – yeah I know, for good reasons. I agree with others that mention chicken fat for frying matzo. Since Nyfat went away I found a mix of butter and oil with some onion powder works very good but schmaltz is best IMO. 4 eggs with 5 sheets. Slight water soak, just let some water run over the matzos but also let the matzo soak in the egg mix for a few minutes before frying in LOTS of butter/oil/schmaltz. Only spice is some onion powder and kosher salt – serve with some type of berry preserves. I use a hinged electric grill – raised upper grill and fixed bottom grill. Oil both plates, preheat, and ladle on and spread out brei mixture. Close, heat till browned as desired. Remove, slice and enjoy. My matzah Brie is different. Break up 2-3 sheets matzah into small pieces and cover with boiling water for about a minute. Drain off water and squeeze the pieces to get more water out. Beat 2-3 eggs well and pour over the softened pieces. Wait for the eggs to begin to soak in. No milk, since historically these would have been cooked in chicken fat. Add oil to pan and heat. Once hot, add large spoonfuls of batter and cook, flipping, until brown and crispy on both sides. I make matzoh brei like my mother taught me (and she learned from her Lithuanian mother). It’s a different technique than those I’ve read online. I like that the matzoh gets cooked enough but is not mushy. Scramble 1-2 eggs, set aside. Break the matzoh into pieces approximately 2-3” square, give or take. Add enough butter to a large pan over low/medium heat to allow the matzoh to soak up a delicious amount. Add the matzoh in a single layer without overlapping. After about 30 seconds, when you see the butter soaking into the mstzoh, pour in the beaten egg, making sure you get it in between those spaces between the pieces of matzo and then pour the rest it in. Turn it over to make sure the liquid egg is cooked and serve! I make matzoh brei like my Romanian mother-in-law taught me. It’s like yours, but the broken pieces of matzoh, get submerged in milk, that has first been warmed on the stovetop. The warm milk adds flavor to, and better softens, the matzoh. Once the milk has become heated, remove from the stove, and dunk in the matzoh pieces to fully cover them in the milk. Let soak 5 minutes or while beating the eggs and salt in a separate bowl. Then pour the milk/matzoh mixture into the eggs, and thoroughly combine. Fry up the mixture in a large, buttered skillet. When almost set, sprinkle the brei with a healthy scoop of sugar and cinnamon. thanks for the recipe, came out amazing! Made this just as the recipe lays out. Yum! So easy now I expect to be able to make it many times in the future. My family loved it! This is the way my grandpa used to make it. That’s what my grandma did, except that she didn’t soak the matzoh. She crumbled it right into the beaten eggs, mashed everything a little finer with a fork, and put it in the skillet. It comes out like a pancake and it’s to die for. I made this for breakfast and it was very good. I will definitely make this again. Thanks for the awesome recipe! I live alone so I am planning to try this using the “mug” method – cooking in the microwave in a mug. I have cooked eggs in a mug a number of times and as long as I cook, stir, cook, etc., until the desired degree of doneness I am successful. Will also try adding a bit of onion and bell pepper. My favorite .. my mother formed the mixture into patty like pieces…not too thick, never scrambled. We always eat them with either regular sugar or strawberry jam. I love them cooked brown and crispy on the outside. I am also a Sephardic Jew. My dad was ashkanazi. I grew up eating a lot of Greek food cause that’s where my grandparent came from. I remember when my dad made us matzah Brei he would soak the matzah in milk and he would use a little schmaltz (chicken fat) that was the key to a great tasting matzah brei. Soaked in milk and then chicken fat? How is that a Jewish dish with milk and meat together? DJ– not every Jew keeps kosher. It’s a personal choice. I made it just now. I didn’t have sour cream but I did have chunky applesauce. It was delicious! Thanks for the recipe. ? I discovered Matza Bria several years ago l like to keep it simple. We prefer savory over sweet. So I make them individually using 2 eggs and one Onion flavored Matzo Cracker per person.. Add a little salt and pepper. Everyone gets excited when I suggest Matza Bria for breakfast. Great idea Tori! My mother-in-law taught me to make it this way: Start chunky onions (as much as you like) in a large frying pan to saute and ready a bowl filled with a box of large broken (everything, or plain, no matter) matzoh pieces. Pour hot water into the bowl, submerge matzoh, then quickly drain. Very gently fold in 6 or 8 beaten eggs, ensuring full coverage of egg with matzoh, then slide onto the onions, without disturbing them too much. Cover and let steam on med-low heat (too high and the onions will burn). About half done, break into large bite-size pieces, add some butter and/or olive oil to the pan bottom, and turn over the pieces. Allow to finish cooking uncovered, salt and pepper to taste. Nothing more needed. Rich and addictive. chopped spinach , extra seasonings. I am just about ready to try this matzo brie recipe for the first time. It is the third day of Passover and I was already running out of ideas. Especially now that I only cook for me! I always saw matzo Brie on the menu at the Roll n’ Rye in Culver City California. Never ordered one. I am a Greek Jewess! I’m going to make mine with onions,mushrooms and feta cheese. I will probably continue to make it for breakfast in many different variations until the end of Passover. Who knows, I may like it so much that I may fit it into my eating plan over the course of the summer, along with my favorite mixed watermelon, honeydew and cantaloupe. We Greeks love FETA CHEESE, ripe melons, and kalamata olives! I’m writing to tell you that my mother’s maiden name was Yampolsky; later changed to Yampol. Maybe we’re related. Great post!! An old friend of mine, who I call my 2nd mom, told me her favorite breakfast was matzo brei, I asked her what it was, she told me: eggs and matzos, fried. So here I am, looking at your recipe, I am going to give this a try as it sounds delicious (trying this with sauteed onion) as many commented on this. Thanks for always sharing your wonderful posts with us readers! Happy Passover!! Someone asked what the word “brei” means – it’s from German and it means porridge or mush. Oatmeal can be called Haferflocken Brei. So grits, oatmeal, polenta, anything with a texture like that involving grains and a liquid could be called a brie. Brei, in German, means “mash”. Our mom made Matzo Brie the same Bubby did, no measuring needed. Wet matzo under running tap water just to dampen, Break up matzo into smaller pieces (size & shape doesn’t matter) dip in egg/milk mixture. Be careful not to let them get limp just enough for a good soak for egg flavor you can use salt & pepper if you wish. Fry pieces in butter and repeat. The edges were always nice and crispy. I don’t recall any egg mixture being left as they would just fry till it was gone. Our Matzo Brie was always served with a choice of applesauce or sugar on the table. Sweet is the ONLY way to go. This recipe made the best matzo brei that I have ever had! Thank you for it. Eleanor, did you keep mixing it up while cooking in the microwave? How long did you cook it for? To Bev Hoffman-Rush: Just cover with a microwave safe cover and micro on high, figure a minute per egg and when done, check to see if eggs are cooked to your liking. If still runny, try another minute. With microwaves, you can’t undo overcooked but you can correct under-cooked. Also, a microwave is not like cooking on the stove, you don’t keep stirring the food, plus you don’t smell up the kitchen like when frying something on the stove (plus no more splattering). Also cleanup is a breeze. You can grease the glass dish if you want but it isn’t really necessary. and it was amazing. You’ll love it too! minutes in microwave until cooked and then added salsa on the side. Why would you cook it in the microwave though? What is the benefit or incentive for experimenting with a microwave assuming you have a stove top? I avoid using the microwave wherever possible. It’s a convenience, if I’m in a big rush I’ll use it to reheat something but it does not cook food, it heats it. Matzo brie cooked on the stove top is delicious, cooked in a microwave I can’t imagine wanting to eat it. Thank you for your matzo brei method, Tori Avey – this is my second or third Passover using it and it has changed my matzo-brei life! I like it with sauteed apples, or onions – maybe both?! This sounds a lot like fried matzo. The recipe very easy, eggs mixed together well, then add broken up matzo. I like a lot. Fry it in a pan, using butter or oil. Brown on both sides. I use butter on top, then syrup or jelly. It’s yummy. Never used applesauce or sour cream. I use those on potato latkes. Question about latkes, how do you keep the potatoes from turning brown before mixing other ingredients in? Hi Bev, I usually grate the potatoes straight into a bowl of cold water. Keep the shreds in water until you’re ready to prepare the mixture. Drain them carefully by tipping the bowl at a slight angle. Some thick white “gunk” will settle at the bottom of the bowl– this is starch, and can be added to your latke mixture to help them bind together better. When you drain the shreds, squeeze as much liquid as possible out of the shreds. I use a clean tea towel to really wring them out. Keeping them covered with water until just before you’re ready to make the latke mixture should help with the browning issue. Good luck! To prevent potatoes from turning brown( really not necessary)a little lemon juice or vitamin C tablet will do the trick. We don’t bother with that. We wash potatoes cut them in small pieces, place,with onion, in food processor and pulse to desired consistency. Once fried the color of the potato is moot. Interesting…I use 2 sheets of egg and onion matzoh/each egg. Scramble eggs with water, then add broken matzoh crackers.A little chicken broth can be added for additional flavor. Always used to fry in Nyah fat, but since it isn’t made any longer, use a little olive oil and butter. Saute some chopped onion and add the soaked matzoh…mmm good. Just salt and pepper…nothing more is needed! Love it!! My father used to make it when we were kids, we didn’t want to eat it then – did not appreciate it. Wish he were still here to make it I would live to eat with him again!! 🙂 I make it now! I eat mine with salt and my husband ate his with sugar. I guess it’s how you are raised. My dad always made it with feta cheese and a little Parmesan. He also added a little water to the pan with the butter. Whatever happened to matza Brie with 1. Matza. 2. Eggs. 3. And diced spring onions. Never heard of no diced spring onions , browned slightly and then matza soaked in milk and the eggs. You will never eat it without the browned , diced spring onions again. I always eat my fried matza with some butter and grape jelly on it. Its so good!! My parents couldn’t agree whether it should be with salt…like scrambled eggs…or with sugar like French toast. As a result, I ave to have it with both salt and sugar. Add some blueberries to it for breakfast. Scrambled with onion. Reminds me of my Nana feeding 5 grandkids on a summer’s night! A great use for leftover charoset! love it………….lightly browned……….I want ! ! ! I like caramelized onion, spinach & mushrooms with swiss! Awesome, I worked as a cook in a Jewish restaurant years ago and haven’t had this dish since then. We just made it for Easter breakfast and it was delicious. I used gee instead of butter and the clarified concentrate butter gave an excellent flavor addition! Ghee is a great idea! This is the first-Saturday during Passover dish I make every year. My son now makes it, too. As an aside, the word “Brei” means “porridge” or “mas” in German and Yiddish. 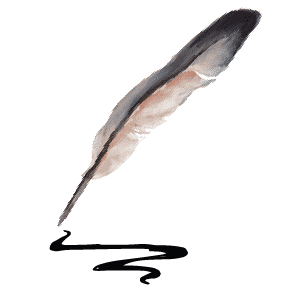 In both languages, the letter combination “ei” is always pronounced “eye.” In fact, “ei” is the German word for “egg.” TMI, can’t help myself, I’m a writer. Great recipe! For a different texture, cook the eggs and matzo desperately and add together at end. This makes for a crunchier texture. Thank you so much for this website. I am not Jewish, am trying to learn more about it, and hope to one day convert, but till then am trying to keep a Kosher kitchen. So happy you’re enjoying it Jennifer! I like this recipe very much. I usually use mushy matzo, but I also like this texture. Our family sprinkles with cinnamon & sugar mixed together. The savory Brie with onions sound good, too. Just discovered this site in time for Passover. Made the roasted asparagus, arugula & avocado salad & the orange rosemary medley (sans nuts or dates). Both were excellent & Seder hits! Going to try out some desserts over the next year! Thank-you! Ps/ My Aunt Rose was a long-time Factor’s waitress, a real institution there! Marva, welcome to the site! So happy you’re enjoying the recipes. How great that your aunt was a Factor’s waitress! I’m intrigued by recipes for savory matzo brei but I always wind up making it as my mother did,I – sprinkled with cinnamon sugar. I used to add spoonfuls of grape jelly as a kid but we usually use maple syrup now. I love this dish, my favorite way to eat it is with sour cream and hot sauce. I cannot eat carbs for awhile, but when the time comes that I can, I hope to at least find a whole grain matzoh to use….I cannot wait! Yes, TU Leah! We always called it fried matzoh. What does brei mean? And I was taught to soften the matzoh in a bowl and add the egg to that and then add all to the pan. I’m looking for a recipe for sautéed apples with the fried matzoh but may just wing it and try it tonight with my leftover matzoh. Sounds almost like dessert! Excellent recipe! I added chopped red & yellow sweet peppers and KLP fontina cheese (in chunks). Fantastic!! Many thanks! In my house we always ate it with sugar sprinkled on. Something about the graininess and the sweetness of the sugar on the matzo brie works really well. We also used to call it fried matzo. This is also how our mom served it. Here is an idea you might also like to try. I saute chopped onions. When the onions are clear I add them to a bowl of the scrambled eggs. To this I add small pieces of lox and stir. Pour the egg mixture to the soaked matzo pieces. I absolutely LOVE matzo brie! So does my granddaughter. I like to saute a chopped onion in the butter before adding the matzo and egg mixture. Plenty of salt and pepper is the crowning touch. Try the onion….you will never return to just plain matzo and egg again. My mom was Protestant, my dad a Jew. We had some interesting meals! 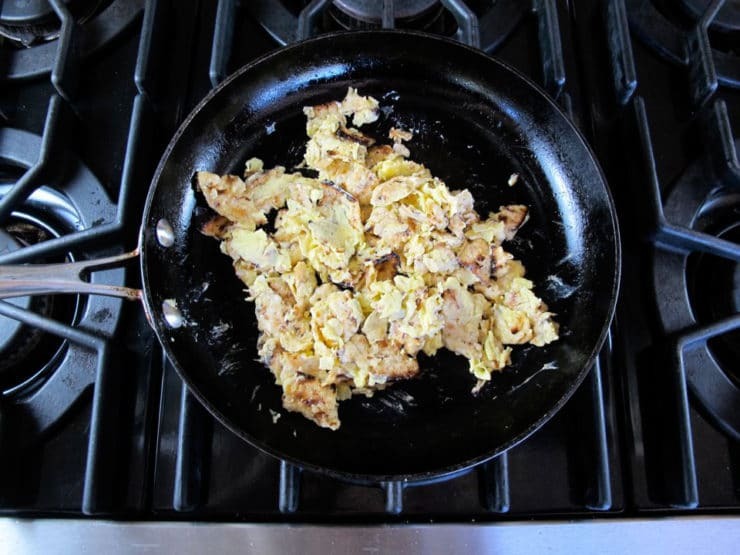 As kids we called this “scrambled matzo” and enjoyed it for breakfast with maple syrup. Occasionally my mom would make eggs similar to Eggs Benedict, except the sauce was curry spice flavored. She’d serve the eggs atop the matzo brei. I don’t have a recipe and Mom is gone now. It may sound strange but it was absolutely delicious and wish I could recreate it. I make mine the way Phil does it above. Soak the matzoh and drain. Pour the egg mixture over drained matzoh in bowl. BUT I saute 1-2 finely chopped onions first till they get a little brown, then add the matzoh and egg mixture. Add salt as necessary to your taste. Trust me—the onions are delicious with it. I have always soaked the Matzo and add the egg mixture. I like it as a large pancake and have included blueberries in season. When my Kitchen was being renovated I had to live off the microwave. I quickly found out it can be done in the microwave as well. Cube salami. Put in large fry pan. Mash Matzo in big bowl.. Add 1 half cup of water. Mix well let sit. Stir before using. Mix eggs in separate dish. Fry salami till pan is greasy. Empty salami into plate. Add cooked salami and mix well till all is cooked together..
Eat.. add jam if you want but I love it just the way it is.. Sounds delicious but salami with eggs is not kosher. It is if you use kosher salami 🙂 eggs are neutral (pareve). Yum. Wonderful. We too are Sephardic…my hubbie won’t even try this! But kids and I love it. Eggs for sure are Parve…eat them with anything. Sephardim should not eat fish and meat or fish and dairy together…and of course no dairy and meat. But eggs rock because they go with anything! Chag Sameach! ‘pancakes’, ”SUGURY'” “maple sugar” Give it up! Add maple sugar to taste. my family would use the onion matzo and serve with salt and sour cream – we also kept it in one piece-so it looked like a very large pancake! YUM!!! Nancy I’ve never tried it with onion matzo, sounds like a yummy variation! I love the sour cream, too. Nummy! Love this site. And especially Matza Brie….when I was working in Brooklyn for the Dime Saving Bank of NY (now defunct) on Ave J and Coney Island Ave.,(1974). Most of the employees brought their lunch to work…one of the mail ladies, Sylvia, heated her lunch one day. It smelled delicious and I asked her what was it. Matza Brie she replied and then she explained how she made it….she soaked her matza in milk…she sauteed onions in butter added the matza then the eggs…voila!~ the best I ever had! Try it – you’ll love it! I miss that neighborhood…Stern’s Bakery was a few doors away…they had the most incredible honey cakes. Do you have a recipe for that???? Here are my two Matza Brie recipes. The main difference is that I do allow the Matza to get very soft. There are two Matza Bries here. The first is my favorite, but neither is less authentic. They come from different areas of Eastern Europe. The first is more from Poland and the second is more Lithuanian. Break up matza sheets and put in bowl covered with water. After the matza has soaked 5 minutes, drain the water and then add the eggs and mix. Add the water and sugar and mix. Pour the mixture evenly in a pan sprayed with non-stick spray (or coated with butter). Cook over medium heat until the bottom turns light brown, about 4 minutes. Flip matza Brie and cook other side covered for about 3-4 minutes more. Serve with cinnamon-sugar or jam. Break up matza and place in bowl covered with water. Soak the matza for about 5 minutes until soft. Scramble as you would plain eggs adding a little salt and pepper as you cook. Variations: You can do almost anything you want with these recipes. The only thing I would suggest, is keep the first recipe sweet and the second savory. You could make the first one savory, but that would be less authentic. You can add milk in place of the water in the first, and also add some of either to the second. Add any extra flavorings or spices to the first recipe like cinnamon or nutmeg. I recently discovered how much I loved Jewish food. I’m Lithuanian, and have noticed many similar foods. I was planning on making Matzo Brie tomorrow, and naturally came here – Tori is my go to for ideas- and read this post. Once again, the Lithuanian connection! Interesting Lilly. You will love this! Thanks Tori, GrandMaMa made it salty with a sauce and sour cream on side! I havent had this since I was 7 yrs til I was 10, and only had it over GrandMaMas house! Thanks for bringing back memories you can use the onion flavored Matzos, grandMama would fry and brown an onion in it! The sweetness of the onion made it so good, Im going to make it with onions and onion flavored Matzos over weekend! Thanks again! hold each matzo sheet nder hot running water til softened (not mushy). Break into 1 1/2 inch pieces and place in a bowl. Beat together milk, sugar, vanilla, salt and eggs. Add broken matzo. 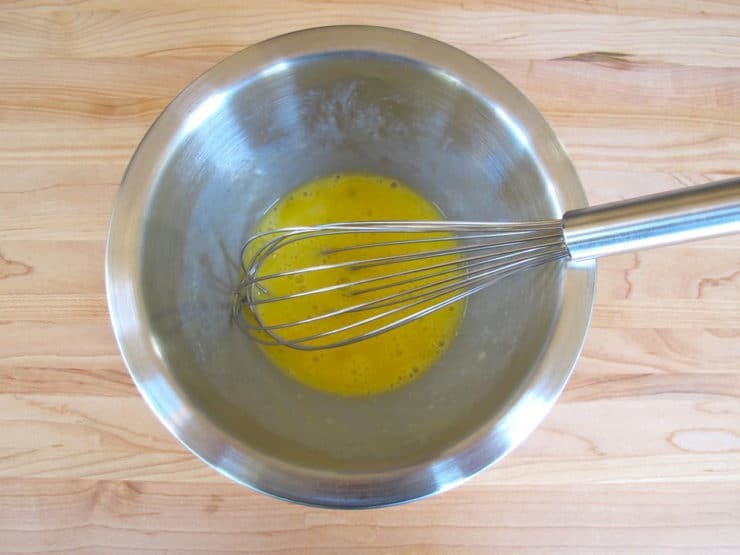 Melt butter in a skillet and add egg mixture. Stir as you would for scrambled eggs til mixture is set and golden brown. Toss in gently sliced bananas and raisins. Serve warm. My kids like this one with maple syrup too. LOVE matzobrei! Mine differs only in that I don’t soften matzo with water….break crispy matzo into frying pan with LOTS of butter….stir it around, browning slightly, then add the whisked eggs…you get a fried crisp matzo bite with egg flavor. I also top with powdered sugar! Going to try farfelbrie next! Robin, I used your basic recipe but did not add raisins or bananas. My mother and I enjoyed it so much for a late breakfast this morning. I sprinkled cinnamon sugar on top. She thought maple syrup would also taste great but we didn’t have any. We want to have this again before the week is out. Your recipe is a keeper!